What is it like for a convicted murderer who has spent decades behind bars to suddenly find himself released into a world he barely recognizes? What is it like to start over from nothing? 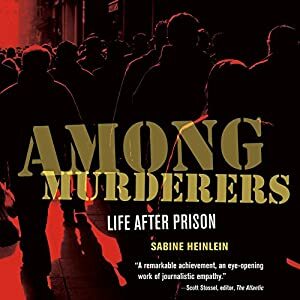 To answer these questions Sabine Heinlein followed the everyday lives and emotional struggles of Angel Ramos and his friends Bruce and Adam – three men convicted of some of society’s most heinous crimes – as they return to the free world. However, this isn’t only a book about the difficulties of reintegrating – like finding a job, finding a home, dating, and figuring out how to live in a world that has matured 30 years while you were locked away – it is mainly comprised of doing research into the murderers’ backgrounds in order to give an adequate description of their crimes, who they were, who they have become, and what factors have influenced their lives. This gives the book a personal flavor – it encourages compassion and understanding for the three men and their troubles, without totally discouraging your caution in dealing with such men. I’m going to soon be volunteering with people recently paroled, helping them to reintegrate and to reduce their chance of recidivism. I thought this book would be helpful and interesting. Although it spent a little less time focusing on current troubles of the three men, this book was incredibly helpful. This sounds really interesting for so many reasons. I think that you reading this prior to your volunteer work is a really good idea. i wonder how this work will influence your perspective on these issues. Well, I guess I already feel compassion for people who are recently released from prison because I've seen how difficult it is for them on the outside, and I am highly critical of our justice system (especially the overcrowded and incredibly unhealthy) prisons. But I think every exposure I have to compassion and understanding will increase my own. The fact that this book includes the men's backgrounds seems important for inspiring sympathy. I don't generally have sympathetic feelings for convicted murders, but I could see feeling a bit differently if I knew they came from difficult circumstances. This does sound like a great book to read before you start your volunteer work! It's easier to have sympathy when you know more about their lives. There was one of the characters, Angel, I think, who didn't inspire much sympathy in me. But the other two did. I think it's good to recognize that these are human beings, even if they've done terrible things.